SEVCA is honored to be part of a strong community working together to meet needs and change lives in Southeastern Vermont. OUR MISSION: The mission of Southeastern Vermont Community Action (SEVCA) is "to enable people to cope with, and reduce the hardships of poverty; create sustainable self-sufficiency; and reduce the causes and move toward the elimination of poverty." SEVCA works to find solutions to the deep-seated problems of poverty, largely by empowering and collaborating with those whose lives are affected by it daily. We address people's immediate needs for fuel, housing, food, and other essentials to help stabilize their lives in the short term, and provide further tools and support to help them achieve greater financial independence in the longer term. SEVCA was created in 1965 as a part of the nationwide 'War on Poverty' and chartered as a Community Action Agency (CAA)—a private non-profit corporation, locally initiated and governed, and designated by local, state, and federal officials as the 'anti-poverty agency' serving Windham and Windsor Counties. Learn more about SEVCA's history here. Visit us on Facebook (click "Facebook Activity" on the left of this screen) for recent updates on SEVCA's activities. Read about the needs of the people we serve in SEVCA's Community Assessment. The majority of SEVCA's communications have been re-established, following a period from late January to late February when our network was down. If you are still having trouble contacting someone at SEVCA, please contact the main office at : 802-722-4575 or 800-464-9951. Thank you for your patience. This past year, SEVCA proudly served 4,003 households, consisting of 9,229 individuals. Make a donation now. 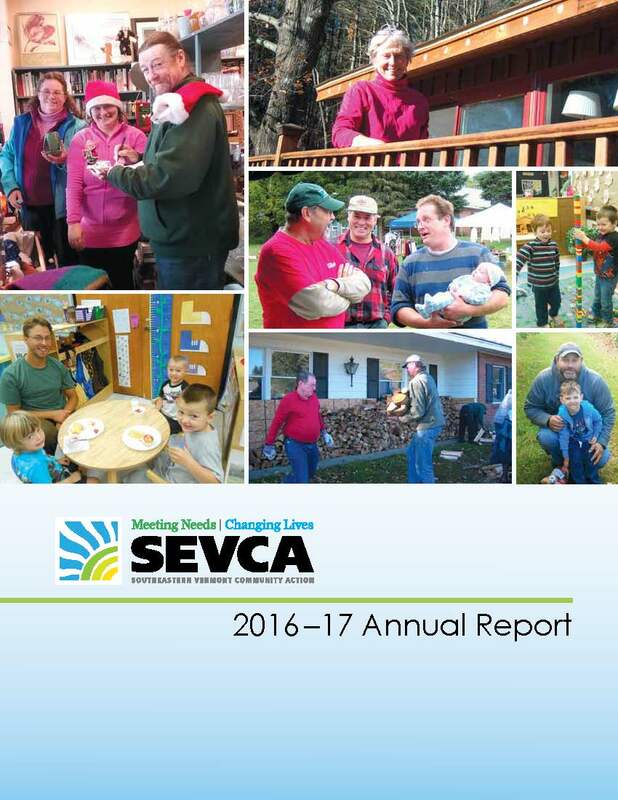 SEVCA's 2016-17 Annual Report demonstrates the impact of our programs on the lives of the people who have participated in them. Engaging stories highlight the experiences of real people and how they have achieved personal successes and improved their lives with SEVCA’s help. Click here to read the Annual Report.